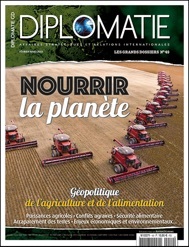 In its February-March 2019 issue entitled “Feed the planet - geopolitics of food and agriculture” (Nourrir la planète - Géopolitique de l’agriculture et de l’alimentation, in French) », the French magazine “Diplomatie” presents a very informative picture of the current situation, main actors and perspectives of global food. From this editorial, one could believe that, foremost, combatting hunger would be a question of resolving a lack of food availability and of producing more food, while we know that undernourishment and severe food insecurity happen in a world of plenty - at least for the time being. One can regret that the editorial omits to mention one of the main causes of undernourishment that is well highlighted in the interview of L.G. Bellù of the FAO, namely poverty and inequality that are a consequence of the development paradigm that underpins the way the world economy operates [read]. It is this very paradigm that guides current food and agricultural policies, as stressed by T. Pouch in his article. Let’s remind here the work conducted by the World Inequality Lab and by Branco Milanovic [read]. If the food and agricultural production model chosen after World War II allowed a spectacular growth of agricultural production and achieving considerable surpluses at world level, it remains a model of exclusion. Aren’t most of the undernourished people peasant farmers living in poor countries who do not have access to the most productive technologies because they rely on the use of machines, seeds and agrochemicals that are out of reach of them because of their prohibitive prices? Over time, tens of millions of peasants have been excluded from agriculture and their land has been left to larger agricultural corporations with a lower productivity [read]. In rich countries, this rural drift has contributed to the emergence of a deserted countryside, a problem zone where marginalised population groups live: in France for example, this has become an issue of which everyone has become aware these last months. In poor countries, the downside has been a movement of population that led to the emergence of megalopolises with their vast and destitute shantytowns (Lagos, Mexico, Mumbai…). Of course, from a historical point of view, mechanical and chemical industries could develop largely because agricultural was their client, but environmental consequences of this model (e.g. pollution, GHG emission, loss of biodiversity and reduction of the level of biological activity in soils) put food production and our health in danger [read], while encouraging waste because food prices are maintained artificially low. Indeed, these prices do not reflect all the effects and costs (externalities) of food production and they orient consumers towards products that are the result of non sustainable technologies. In addition, another characteristic of this mode is that, of recent, investment in land and agriculture have become a new frontier for financial institutions (pension funds, or investment funds, in particular) and for agribusiness multinationals looking for profits to be able to pay huge dividends to their stockholders, a process that generates further exclusion and violence. •The development of new capital intensive technologies - often linked to Big Data - that contribute to make our food production more “artificial” and that are factors of exclusion (precision agriculture [read], high-tech in production, transport and storage of food [read and watch the video on Sustenir Agriculture from 12’10 to 15’50], cultured meat and taylored food printing [watch the video on FIRC from 16’00 to 19’00). Considerations related to the environment should have included, in addition to rising temperatures and change in rainfall due to climate change and that constitute a threat for the quantity of food produced, the analysis of the consequences of climate change on the amplification of extreme meteorological events and on the nutritional composition of food produced [read]. It can also be regretted that the impact of the industrial agriculture model on biodiversity is only looked at from the angle of the pollinator issue taking bees as an example - even though it is very important, but makes no mention of another dimension at least as much of concern, namely the loss of biological activity of soils that some address through the presence of earthworms, but that does in fact involve a myriad of organisms, among which mushrooms are of central importance. These organisms are essential for plant growth (it is good to remember that soil biomass is several times bigger than biomass existing on the surface), as this form of life plays a central role in soil-plant exchanges and in the carbon cycle. •Our consumption of animal products which is an extraordinary source of wastage (around half of the grain produced is consumed in a non efficient way by animals in mass animal farming of an industrial nature who are in direct competition with humans for this product). There is no question here to reject the idea of consuming animal products and of producing them, as animals are a way of using certain ecosystems where cropping is impossible, too risky or inefficient when compared to efforts made. •Food wastage, although it has been discussed repeatedly in the media during these last years. It is indeed quite probable that it will be difficult - if not impossible - to find a sustainable solution to the food issue without changing in-depth our consumption in order to make it a more efficient user of resources available. Such a profound change would open up the possibility of implementing a scenario of hope that would orient our consumption on a more sustainable (less chemical pollution, less GHG, more accessible technologies) and inclusive path for a mass of peasant farmers whose future remains a source of extreme concern. To concretise such a scenario, conditions required for it to happen need to be defined, particularly in terms of public policies, including price policies that would turn prices into a better indicator of the real cost of food. Such policy measures would need to be launched as soon as possible, now, but in a gradual manner, and thus avoid waiting for the last minute as it was done in countries like France for the price of energy - with well known consequences that have been present on the international media. Immediate action is required now, in order to be in a position, like Sweden did it for the price of energy, to make food prices evolve smoothly but steadily so that this change becomes acceptable for all, and particularly for the more disadvantaged population groups. This transition will also require social and fiscal measures for the more vulnerable, as well as a strong support to public agricultural research so as to offer consumers a larger choice of affordable and sustainable food products [read]. •Diplomatie, Nourrir la planète - Géopolitique de l’agriculture et de l’alimentation, Les grands dossier No.49, Février-Mars 2019 (in French). •Bellù, L.G., et al.,The future of food and agriculture - Alternative pathways to 2050, FAO 2018. •The Economics of Ecosystems and Biodiversity (TEEB) (2018), Measuring what matters in agriculture and food systems: a synthesis of the results and recommendations of TEEB for Agriculture and Food’s Scientific and Economic Foundations report, UN Environment, Geneva, 2018. •City of the Future: Singapore – Full Episode, National Geographic, (see in particular between 12’10 and 15’50, and between 12’10 and 15’50), 2018. •Fresco, L., Splat goes the theory, Aeon, 2015. •DaMata, F. M. et al., Impacts of climate changes on crop physiology and food quality, ScienceDirect, 2010. •What future for our food? Three scenarios picture quite different futures, 2018. •Are industrial megafarms the solution for feeding the world? 2018. •Growing inequalities are a threat to world social and political stability, 2017. •Food, Environment and Health, 2017. •Thirteen myths about hunger…, 2015.